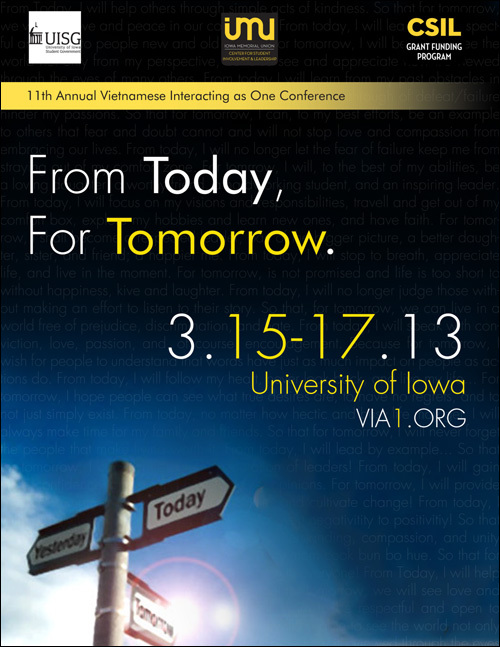 The University of Iowa is hosting the 11th Annual Vietnamese Interacting as One (VIA-1) Conference March 15-17, 2013. The Vietnamese Student Association (VSA) at the University of Iowa, in addition to the Union of Vietnamese Student Associations of the Midwest (UVSA-Midwest), is proud to have the privilege to host the eleventh annual Vietnamese Interacting As One (VIA-1) Conference. The annual VIA-1 conference is considered to be one of the premier youth conferences in the country where hundreds of students partake in activities and workshops to build their leadership skills, increase cultural awareness, and advocate for/against issues affecting the Vietnamese community. Through the conference, attendees will gain a unique perspective on Vietnamese culture and the Vietnamese communities here and abroad. By participating in conference programs, the Collective Philanthropy Project, and other leadership development initiatives, participants raise appreciation for Vietnamese culture, take part in philanthropic efforts, and network to make connections that will last a lifetime. We have recently celebrated a “Decade of Progress”. It is now time to move forward into a new decade of possibilities: a future of transcending boundaries and enhancing our mission, our identities, and our presence as Vietnamese Americans. The theme for the 11th annual Vietnamese Interacting as One Conference is “From Today For Tomorrow”, instilling the hopes of our generation to take the experiences we have learned today and applying them to a brighter tomorrow. The struggles we go through will teach us about ourselves and those around us as we foster an understanding in uplifting our community and pursuing our unique passions. Our theme focuses on empowering young leaders and advocates to cultivate what our parents and grandparents have fought so hard for, a better future for the generation to come. Join us as our theme comes to life through innovative conference programming and networking opportunities. With that, we would like to ask you, what will you do today for a brighter tomorrow? Regular registration ends this Friday, February 15. For the schedule and registration information, click here.